Property 53: Exceptional Comfort and Location! Property 55: Historic Brooklyn Apartment w/Stunning City Views! Property 57: Well designed apartment with yard! Property 59: Individually styled apartment 45 minutes to Manhattan. Corp/Long-term welcome! Property 64: Amazing 2 BR Brownstone Apt. Property 82: Beautiful and modern 4 bed/3 bath plus roof deck. Property 85: Beautiful one bedroom apartment w/ den in Historic Stuyvesant Heights! 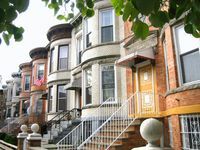 Property 88: Historic Bedford Stuyvesant Charmer: Entire Apartment is Yours! Property 91: Spectacular Brooklyn Brownstone Duplex Garden Apt. A little B&B with a whole lotta love. In the heart of historic Park Slope. Property 100: A little B&B with a whole lotta love. In the heart of historic Park Slope. We stayed a week in this lovely apartment and thoroughly enjoyed ourselves. The apartment was quite large and very well appointed. The host was also a pleasure to deal with with prompt response to every inquiry. 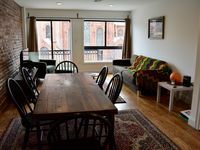 The apartment is conveniently located within a short walk to a subway stop which made getting into Manhattan a breeze. We also found every amenity literally right around the corner: groceries, restaurants, wine, all the important stuff! Thank you so much for helping make our visit wonderful! Stefan was a super host! We, three ladies, felt right at home. Plenty of space for all of us and a perfect location near the subway.